A social network like Twitter is much more than a platform to send Tweets: It is a summary of the nation’s mood, a reflection of the country’s ambitions and a barometer to check the pulse of its citizens. Out of 271 million users of Twitter globally, which posts 500 million Tweets every 24 hours, 35 million users are from India. 35 million or 3.5 crore Internet savvy Indians use Twitter to share their joy, pain, sufferings and desires. The short 140 characters messages which these 3.5 crore Indians shared via Twitter can be described as an amalgamation of their emotions and their state of mind. 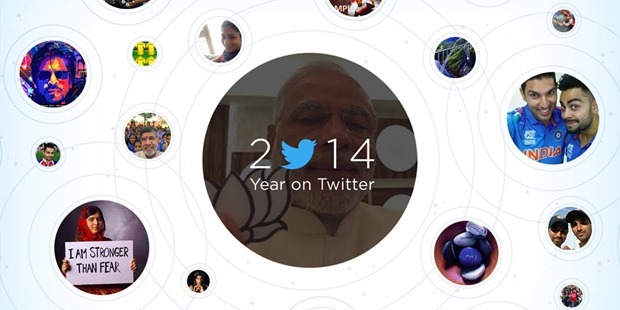 What can be a better way to understand India in 2014, than analyzing the top moments of Twitter India? On May 16, 2014, 12.09 PM, India’s 15th Prime Minister Narendra Modi shared the victory news via Twitter, and that Tweet has become the Golden Tweet for 2014 with 70,513 retweets. Never before in the history of Independent India, a PM had shared his joy this way. Surely a defining moment for India. Right now, after Barack Obama, Narendra Modi is the most followed leader globally. At #2 is Bollywood heartthrob and superstar Salman Khan’s Tweet sharing the link of his movie Kick’s trailer which received 51,981 ReTweets. Bollywood is a very important factor in the overall life of an Indian, and the fact gets cemented via Twitter as well. Not surprisingly, Bollywood superstar Amitabh Bachchan is the most followed Indian on Twitter right now with 11,818,056 followers. Shahrukh Khan with 10,246,755 followers is at #2 while Aamir Khan with 9,866,492 followers is at #3. PM Modi added 4.6 million new followers in 2014, a record in itself because he had less than half of them at the start of the year. Aamir Khan, the evergreen popular Bollywood actor added 3.9 million followers while Amitabh Bachchan was followed by 3.7 million new followers in 2014. Hashtags represent the trend, the pulse which is influencing the country, and in that list, #WordCup2014 was the fastest spreading hashtag in 2014. Malaysian airlines MH370, which disappeared from radars and is still missing was at #2 position, followed by #MufflerMan which represented Aam Aadmi Party Arvind Kejriwal. Twitter heavily revolves around the news, the current happenings and the new trends. When Rohit Sharma scored 264 against Sri Lanka in November, then the topic ignited unprecedented conversations and Twitter India was on fire. Similarly when Rajinikanth joined Twitter, 200,000 followers had connected with him within 24 hours.